Below is a copy of a message David Cameron is sending to party activists, members, and staff this evening. Sam and I have been overwhelmed by all the letters, cards, emails and flowers we have received about Ivan. Sending an e-mail this week just gives us both a chance to say a big "thank you". It means a lot to know that others are thinking of us and him. We always knew Ivan wouldn't live forever, but we didn't expect to lose him so young and so suddenly. He leaves a hole in our life so big that words can't describe it. Bed time, bath time, meal time - nothing will feel the same again. We console ourselves knowing that he won't suffer anymore, that his end was quick, and that he is in a better place. But we all just miss him so desperately. When we were first told the extent of Ivan's disability I thought that we would suffer having to care for him but at least he would benefit from our care. Now as I look back I see that it was all the other way round. It was only him that ever really suffered and it was us - Sam, me, Nancy and Elwen - who gained more than I ever believed possible from having and loving such a wonderfully special and beautiful boy. Are they embarrassed or something? It really does reveal an awful lot when Progress holds a one day conference on Labour's online strategy and Gordon Brown is the phrase which dare not speak its name. 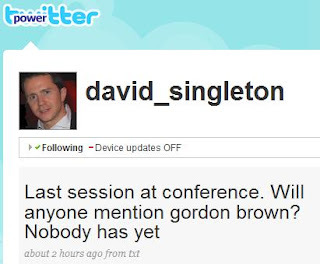 David Singleton is political correspondent of PR Week. 1. Tim Worstall is less than impressed by Frank Field's latest initiative. 2. Hopi Sen advises Gordon Brown what to say to Congress. 3. John Rentoul on the fall out between Labour's favourite pollsters. 4. Wrinkled Weasel is worried about sexually aroused film censors. 5. Dr Crippen advises banks not to patronise Master Dr Crippen Junior. 6. The new Bagehot blog thinks the civil liberties agenda could split the Conservatives asunder. 7. Sunder Katwala thinks Labour is still the party of civil liberties. No, really. 8. Chris Paul has the latest Downfall video on Hitler's failing Twitter strategy. 9. Guido has a video of Prescott and Campbell remembering my name, but not that of that fantastically successful Draperlist website thingy. 10. Alix Mortimer writes possibly the longest blogpost in the history of blogging, live from the Convention on Modern Liberty. 11. Hold the front page: Sunny Hundal is impressed with David Davis. 12. James Forsyth on the difference between three Prime Ministers. For the last two years I have attended the CPAC Conference in Washington. It's a gathering of 'conservatives' from across the US. However, they're 'conservative' in a way which few conservatives in this country would recognise. They really are the faith, family and flag brigade. This is a video of a speech to CPAC today by a thirteen year old young man called Jonathan Krohn. He's published a book called Defining Conservatism. Precocious isn't the word. It makes William Hague's speech to the 1977 Conservative Conference look positively wooden in comparison. I wonder if he will live to regret this speech. Donal Blaney wonders whether to call him "punchable or inspiring". I;d go for both. While on the subject of CPAC, I remember a delightful conversation with a young man on the Movement for American Families stand (it may not have been called that, but you get the drift) on my first visit in 2007. I noticed a poster on the stand which didn't quite say they wanted to see all fags burn in hell, but you got the impression that was where they were heading. I politely engaged him in conversation and we had a 20 minute discussion, which took a distinct turn for the worse when I made clear to him I was one of the people he would like to see burn in hell. At the end of the conversation I said we'd have to agree to disagree and offered him my hand. He recoiled as if I had given him an electric shock. I gave him my best Paddington Bear gimlet stare and said rather firmly: "You WILL shake my hand." And he did. I bet he went and washed it afterwards, though. The better, and in my opinion the correct, modern model of regulation – the risk based approach - is based on trust in the responsible company, the engaged employee and the educated consumer, leading government to focus its attention where it should: no inspection without justification, no form filling without justification, and no information requirements without justification, not just a light touch but a limited touch. In the new legislation we will publish before Christmas we will make this risk based approach a statutory duty of the regulators." I don't need to rant on about the hypocrisy of him blathering on about effective regulation, do I? The banks took their cue from the then Chancellor and acted accordingly. It is Gordon Brown's regulatory system which is to blame for the current shambles, and he cannot be allowed to escape from that blindingly obvious fact. One of the predictable consequences of the banking crisis has been the spectacle of Labour MPs reverting to type in their slavering hostility to the market economy. Brown's Labour Party has largely kept its anti-capitalism beliefs hidden but now they've been set free (who needs Clause 4 now bruvvers? ), the current state of the economy has brought those deep seated and hidden in the darkest places, anti-market views, bubbling to the surface. Last week witnessed one small example of the Government caving into the anti-market brigade; a consultation from Andy Burnham’s department proposing a clamp down on people re-selling tickets. It could have been worse. Thankfully, the Government ruled out a complete ban on the re-sale of tickets. But overall, the document exposes Labour’s failure to understand the basic principles of market economics, its default preference for regulation and its ‘we know what is best for you’ attitude. Here is a typical example; Labour ministers want to introduce a “voluntary” (now where have we heard that before) ban on ticket touting for major events like the FA Cup and Grand National. All that will achieve is to make it impossible for legitimate fans to sell unwanted tickets. EBay and other ‘online’ market places argue that you can be sure it won’t stop street touts – instead, they’ll have the market all to themselves and will line their pockets. What this sorry episode reveals is that Labour still doesn’t understand the basic rules of supply and demand. Pretty worrying when you consider that Andy Burnham’s last job was at the Treasury…but I suppose he knows that if his beloved Everton ever get to a final he will be given a ticket - well as long as they do it this season or perhaps next. 1. Donal Blaney reports from CPAC and isn't impressed by one of the exhibitors. 2. Croydonian is pleased by the poll ratings for the German FDP. 3. Three Thousand Versts of Loneliness on the new Conservative/UUP tie up. 4. Charles Crawford isn't bitter. Oh no. Not at all. Not a bit of it. 5. Taking Liberties thinks I may be giving the Convention on Modern Liberty the figleaf of respectability. 6. Paul Waugh thinks Jack Straw wants a bigger job. Gordon's. 7. Ros Scott tells of a dinner with 4 LibDem octogenarian Peers. 8. Slugger O'Toole on the Irish blogger who has annoyed RyanAir. 9. Guido says Prescott is being a hypocrite on pensions. 10. Jonathan Sheppard explains why private sector involvement in the Post Office is a good thing. 11. Pete Hoskin explains why Peter Mandelson is down in the mouth. 12. The Evening Standard Diary reveals how Brown is chucking Blair out of his bed. This is the week the recession struck for me personally. It's now gone beyond Brown being able to accuse anyone of talking the country into a recession. We're in one and it's going to last a very long time, I fear. "We set up the Financial Services Authority to, you know before we came into power there was a sort of self regulatory system so you know they more or less regulated themselves. We brought in a statutory regulatory system, supervisory system, but of course we couldn't know exactly what was going on in every individual bank and it's only in the last few days to be honest that what has happened over this pension has come to light." Gordon Brown on Radio Oxford today. My flabber is ghasted. And he thinks we will swallow that? IT WAS ON HIS WATCH. HE CREATED THE SYSTEM. IT FAILED. Audit Commission Chief Warns of "Armageddon of Debt"
Most economists and ministers now believe that a prudent fiscal policy means not allowing public sector debt to exceed 40 per cent of GDP. But the Government is under no obligation to manage the public finances with this target in mind. Indeed, Britain is not even bound by the 60 per cent limit in the Maastricht treaty, as Margaret Thatcher managed to win an opt-out from the relevant article. This is just as well, given what has happened since last year. With the debts of the nationalised and part-nationalised banks now on the public sector balance sheet, the ratio of public sector debt to GDP in the UK exceeds that of Italy and Japan. And it is set to grow much higher. On the basis of the planned levels of borrowing, it could exceed 65 per cent of GDP in 2010-11. And at that scale of indebtedness, the Armageddon scenario most feared by the Treasury - that there will be insufficient lenders to match the planned level of borrowing - begins to look a distinct possibility. That is why tax increases and spending cuts are inevitable immediately after the election, assuming that there are signs of economic recovery by then - and why any managers of a public service who are not planning now on the basis that they will have substantially less money to spend in two years time are living in cloud-cuckoo-land. Gordon Brown and Alistair Darling will be furious at Bundred. But it goes to show just how much government is breaking down when a senior public servant feels free to write in these terms. He would never have dared do so when Brown was at the peak of his political powers. Read the whole article HERE. It ought to be making headline news on the 24 hour news channels. So if you want to read more click HERE. I wasn't going to revisit the subject of Sir Fred Goodwin's pension, but Devil's Kitchen has written a very powerful counterblast to my rant against him yesterday, in which I suggested that Parliament should step in and grab back his £650,000 a year pension. I suspect I should have allowed my head to write that blogpost, rather than my heart. Left wing essayist who often writes 1,000 words when 100 will do, but they are all beautifully and forensically crafted. Ex Treasury official Mike Denham is brilliant at mixing wit with superb analysis of how the government seems intent on wasting our money. Phil Hendren is a great example of someone outside the Westminster Village who has proved he can write about politics as well as anyone else. His Times articles prove it. Can be brilliantly sarcastic. Alix Mortimer's flights of fancy are a joy. Her writing style combines humour with searing critique. For a LibDem she's actually very funny. And that's why she's on the Orwell shortlist. On the Orwell list and deservedly so. Has the potential to be Labour's number 1 blogger, but does he have the self confidence? His writing ability cannot be questioned. He's also a thoroughly nice bloke. My favourite Labour blogger is also the funniest on the left - not that he's got much competition. He's also the smoothest and wittiest writer in the left of centre blogosphere. His sardonic sense of irony guaranteed him a place on the Orwell shortlist. Her blogging is too sporadic which implies she doesn't really quite understand just what a brilliant writer she can be. But she has to be herself. No one takes the Michael like Sadie. Her writing ability means that she can go as far as she wants to. His Grace is fluent and erudite and always entertaining whether or not you agree with some of his more dogmatic meanderings. There's no doubt he deserves a column on the Catholic Herald! He may be an old leftie but his writings often display a heart of gold. There's a bit of any angry old man about some of his blogposts but it suits his writing style. He rants like no one else in the blogosphere. But it's ranting in an eloquent, if sweary, kind of way. Eton taught him a lot. If you only read those ten blogs each day, you'd get a fair representation of what was happening in the British political blogosphere. And you get a consistently high quiality of writing. Enjoy. I can't decide if I enjoyed that or not. In some ways it was a gross caricature, in others it was a pretty accurate portrayal of a political assassination. The trouble with political dramas based on real events is that they inevitably involve a large degree of exaggeration - because, after all, they have to be dramatic. Some of the characterisations in this drama were superb. Who would have thought that John Sessions would be able to play Geoffrey Howe with any degree of accuracy. He even got the voice spot on. The actor who played Heseltine was also manically on the money. Others were less unconvincing. To have the suave Lord Ashfordley from Heartbeat cast as the red faced (and many other things besides...) Peter Morrison was a joke. The flashbacks worked very well, and as a bit of a student of this period of Conservative history, I think it was actually very accurate in the way it portrayed many of the events leading up to Mrs T's departure. But I am not sure it added much to our understanding of them. It was irritating to see Ted Heath in a luxurious Leader of the Opposition's office, when in reality that office is nothing of the sort. It was irritating to see only 16 chairs around the Cabinet table, when in reality there were more than 20. The rooms depicted in the Palace of Westminster bore absolutely no resemblance to the real ones. But perhaps I am quibbling too much. 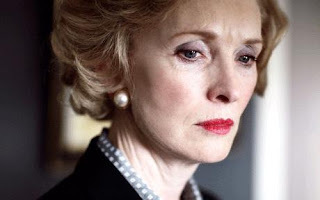 Lindsay Duncan's performance as Margaret Thatcher was in some ways quite amazing. She grew into her character as the programme went on, but there was always a feeling that she was hamming it up a bit. Some of the rows and temper tantrums were just totally OTT. If some of the other characters hadn't been so accurately portrayed, maybe this wouldn't have mattered, but somehow it did. It was, to be sure, a sympathetic performance from Duncan, and perhaps for the general viewer, it was that which did indeed provide something new. It allowed people to empathise with Margaret Thatcher in a way they had perhaps never done before. I suspect even some on the left felt a pang of sympathy, albeit momentarily. I'll be genuinely interested to see what Tom Harris made of it. I don't know what I was expecting from this programme, but whatever it was, I am writing this feeling slightly disappointed. 1. Cicero's Songs responds in a thoughtful way to my post on the risks Nick Clegg might take. 2. Cranmer on Sam Coates's role as David Cameron's speechwriter. 3. Tory Bear says Conservative Future need some help from the centre. 4. Bob Piper on liberty. 5. Oliver Heald on a Thatcher-tastic week. 6. Andy McSmith on when PR can go terribly wrong. 7. Charlie Beckett asks if George Orwell would have blogged. 8. Danny Finkelstein on how we should deal with Hamas. 9. Hopi Sen describes what it's like to go on the Today Programme. 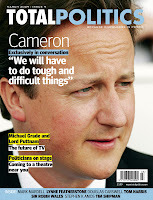 10. Letters from a Tory on the Cameron family tragedy. 11. Event's Dear Boy thinks the political weather has changed. 12. If you're born in Britain you;re British says Damian Green on ConHome. I challenge anyone to get to the end of THIS terribly moving article without tearing up. Ian Birrell is a journalist for The Independent. He and his wife have a profoundly disabled child. They met the Camerons at a dinner party and have been friends ever since. He tells the story of how he and his family have coped with their daughter, Iona, and how their experiences been mirrored by those of the Camerons. Like most families, we struggled to handle the shock of the diagnosis, our dreams seemingly destroyed and fearful of the future while desperately trying to hold a shattered family together. We went from the joy of birth to the depths of depression at breakneck speed. There were periods of intense brooding and tortured discussions. The Camerons also went through a similarly grim period, sleeping beside their son on hospital floors and endlessly discussing how to cope as the hot spring of 2002 turned to summer. ...Listening to some of the coverage in the media yesterday, there is a common sentiment expressed that Ivan's death will be a form of closure, that there might be a sense of relief that the struggle is over. This is a view that reveals so much about attitudes to people with disabilities. No one should be fooled: the only feeling will be one of numbing grief at the death of a cherished member of a family. People have asked me if the death of a disabled child is less traumatic, given that it is always a possibility. I can't imagine that the trauma is any less intense. We are fortunate that Iona is still with us and that we can still enjoy her life. But no parent ever gets over the death of a child – and a disabled child, even one with profound learning difficulties for whom life is a struggle and filled with pain, is no different. Our daughter's life brings us sorrow, but it also brings us intense joy and meaning. Ivan's death means only that, beside the happy memories, there will be a scar on his parents' hearts that can never be healed. It's a brilliant piece of writing. Ian & Linet Birrell and his wife are so clearly devoted to their daughter, who, although she has been dealt a bad deck in so many ways, is so very lucky to have them as her parents. Where Were You When You Heard Margaret Thatcher Had Resigned? The night before Margaret Thatcher’s resignation, I remember having had rows with two Tory MPs who owed their seats to Margaret Thatcher, yet intended to switch their votes away from her in the second ballot. I went home to my dingy flat in Walthamstow feeling angry and let down – almost tearful. Watching the news, my left wing flatmate came home and started crowing about what trouble Mrs T was in. I’m not prone to physical violence, but I was tempted to hit him. By the time Newsnight finished I had realized she was finished. The next morning, I was at my desk in Grosvenor Gardens (I had just set up a lobbying company) when I heard the news on the radio. The world stood still for a moment. I wasn’t surprised that she had stepped down, but it was still a shock. Only a few days before my three year old niece, Emma, had asked: “Uncle Iain, is it possible for a man to be Prime Minister?” We were about to find out. I don’t mind admit I could barely talk and that my eyes were moist. It really was the end of an era. A candle went out that day. The woman who had inspired my interest in politics, saved the country from trade union control and done so much to win the cold war, had gone. Forever. Politics for me would never be quite the same. So where were you on that terrible morning when you heard she had resigned? I see there are plans for Worcester to be twinned with Gaza City. The loony left really are back in vogue, aren't they? The councillor behind the move, though, is Labour councillor Alan Amos. I think it's the same Alan Amos that served as a Conservative MP from 1987 to 1992 before defecting to Labour after having to stand down from Parliament after a personal scandal. It certainly looks like him. 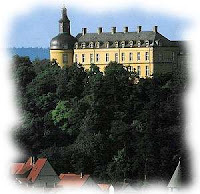 Town twinnings are fantastic arrangements and can have long lasting effects on people's lives. But I really hate it when politics intervene in the arrangements. There are many ways to make political points, but grandstanding like Amos is doing does no good at all. On Saturday the Convention on Modern Liberty is taking place, not just in London but all over the country. Anthony Barnett, Henry Porter and their colleagues have done an amazing job. When Anthony first phoned me about it in mid 2008 I must admit I wondered whether it would work, but with more than 1,000 people attending, it promises to be a landmark conference. We've asked the speakers to talk about why the right seems to have adopted the civil liberties agenda with an enthusiasm which would have been unthinkable ten years ago, and to look forward to a Conservative government and ask how civil liberties can be protected and enhanced under a government with a centre/right agenda. We'll also be asking how serious the Tory commitment is, now that David Davis has left the Shadow Cabinet and questioning whether his successor will adopt a different agenda. I'm told this is one of the most popular of the morning sessions, so do get there in good time to reserve your seat! No, that's not a rhetorical question, but it does lead to two others. What kind of mindset leads to someone authorising an annual pension of £650,000 for a man who has presided over one of the biggest banking failures in British history? And what does it say about Sir Fred Goodwin that he accepted such an outrageous pension? The answer is simple in both cases. It demonstrates that those who led RBS to the brink of failure have learned little from the experience and believe that it's business as usual. Sir Fred Goodwin should be shamed into renouncing this pension, and if he has no shame, then Parliament should act to take it away from him. Just when you thought it couldn't get any worse, I hear news that the Government is set to remove the Staff Hire Concession, in effect forcing the providers of temporarylabour the charge VAT on not just the agency fee, but also the wages of the staff. Hardest hit will be the public services, who cannot reclaim the VAT. In effect the cost of agency cleaners for the NHS just went up by 15%. This robs both in-house and contracted out service providers of the short term flexibility that agency workers can provide. 150,000 jobs are potentially on the line. The Evening Standard reckons this ,move could mean the end of temps in London, putting 25,000 jobs in London at risk - the majority of these are women's jobs. I wonder what Harriet Harman might do about that. Does she even know about it? The decision to do this was announced in last year's budget, but that was well before the recession started. Theresa May should take this up and try to force the government to abandon its plans. There was a discussion on the Today Programme this morning about the shortlist for the Orwell Prize between Jean Seaton and Hopi Sen. Listen to it HERE. Jim Naughtie reckons Orwell would have been a blogger. UPDATE: There's also a related article HERE on the Today website. My vote goes to Peter Oborne. Discuss. In the year we ran Orwell’s diary as a blog, the entries that were selected had to do something distinctive - react immediately to events, take risks, speak to their readers and capture what it means to be at the centre of a story or situation as it evolves. But the best of them do what reporting does - tell us something we need to know, but often with a highly personal voice. I think about 85 bloggers were considered by the judges. I am delighted to have been included on this long list, although being one of only two right of centre bloggers represented (if you exclude Tom Harris! ), I am not exactly confident of my chances of progressing further! 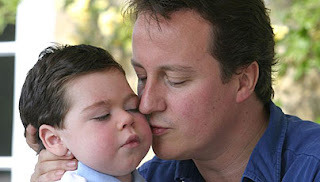 As most of you will have heard by now, David & Samantha Cameron's son Ivan died this morning. He was only six years old. He had a short life but was clearly at the heart and soul of the Cameron family. His parents doted on him and will be absolutely devastated. I have read a lot of the reaction on blogs and Twitter and it's so heartwarming to see the kindness being expressed and the apparent empathy with the Camerons. Nothing can prepare you for losing a child. Nothing. I hope David and Samantha take all the time they need before returning to the fray. Their family comes first. Sarah and I were very saddened to hear of the death of Ivan and we have sent our condolences to David and Samantha. The death of a child is a loss no parent should have to bear. I know Ivan was a child who brought joy to all those who knew him and his was a life surrounded by love. The thoughts and prayers of the whole country are with David, Samantha and their family. I was going to write this blogpost last night, but I was so angry I decided it was best to sleep on it. Bad decision. I'm still fizzing with anger. Yesterday evening I was invited by TIME Magazine's excellent London Bureau Chief Catherine Mayer to attend a screening of an important film about Rwanda, SHAKING HANDS WITH THE DEVIL. The screening took place at BAFTA and was followed by a panel discussion. The participants were Gordon Brown's foreign policy adviser Justin Forsyth, Bob Geldof, Col Bob Stewart, Mark Malloch Brown and an American diplomat, Donald Steinberg. Mr Steinberg served in the White House during the Clinton Administration at the time of the Rwandan genocide. He advised Clinton to keep well out of it - possibly one of the worst pieces of advice given to an American President in the last 20 years. He was rewarded for this failure in the classic way bureaucrats are usually rewarded for failure. He was promoted. He ended up as Ambassador to Angloa and then - get this - became an advisor to the UN on Dafur and even more unbelievably is now a Deputy President of the International Crisis Group. You couldn't make it up. This man had the bare faced cheek to sit on a panel which sought to comment on a film about a genocide which this man had the power to stop. He then had the cheek to berate the current Rwandan regime for being repressive and accused it of trying to shame the international community into providing foreign aid as recompense for their inaction during the genocide. It was all I could do to keep my temper. I have rarely felt so angry. Steinberg is Jewish. He grew up in the shadow of the Holocaust. When he had the influence to stop a repeat in Rwanda he funked it. I don't know how he looks himself in the mirror each morning. But he is representative of a class of so-called public servants who make a career out of supporting appeasement and failing to stand up to aggression. They're people who feel quite at home in the United Nations and thrive in making excuses for that organisation's terrible failures. And when they have finished with failing, they go on the international lecture circuit to lecture us on what should happen in the future. Or they do what Mark Malloch Brown has done and become a GOAT. The only ones to talk any degree of sense on this panel were Bob Geldof and Justin Forsyth. Which tells you what an excruciating experience it was to listen to the rest of them pontificate in their oleaginous 'I know best' manner. I can highly recommend the film, though. It graphically depicts how the Canadian UN General on the ground in Rwanda, Dallaire, was totally let down by his masters in New York. I'd like to think the UN has learned its lesson, but I doubt it very much. So the Tories are backing the government's plans for the Post Office and Jack Straw's decision to block publication of the Iraq war cabinet minutes. It's probably just as well I have been too busy today to do much blogging. 11.1 I have concluded that in relation to the police investigation of Mr.
authority into disrepute in breach of the Code. Boris has issued the following statement. I welcome the report of Jonathan Goolden. He concludes that I did not fail to comply with the Code of Conduct of the MPA and GLA and that I did not disclose confidential information, improperly confer and advantage or disadvantage or bring my office or authority into disrepute. I will now reflect on suggestions for the future on how to deal with extraordinary situations when they arise. I have cooperated fully with Mr Goolden’s investigation and am pleased that it has moved so swiftly to deal with the issues that were raised. I am however disappointed that this investigation has so far cost the taxpayer in excess of £11,000. I am happy to engage in the adoption of a protocol to cover the management of information by senior police officers, senior members and officers of the MPA and I in relation to a critical incident. So that should be the end of that then. The same, sadly, cannot be said of the Caroline Spelman case. It is a disgrace that the Standards & Privileges Committee did not decide on the case this morning and has delayed a decision for a week. I have been in meetings all day, so haven't caught up with the detail. I hope to blog on it later. When I spoke to Nick Clegg at last year's LibDem conference he was very keen to emphasise that he didn't mind taking political risks. In fact, he seemed extraordinarily keen to do so. His tax announcement was certainly evidence of that. His willingness to speculate about post election scenarios is another. This set me thinking. There seems to be a consensus among political analysts that the LibDems will lose seats to the Tories at the next election, predominantly in the South West. I too think this will happen, although I think the power of incumbency will keep those losses to single figures. One of the key Tory messages in the next election campaign should be that a vote for the LibDems (or indeed any party other than the Tories) is a vote for Gordon Brown, and that the only way to oust him is to vote Conservative. There is a way, however, for the LibDems to minimise the effect of that strategy in the South. If Nick Clegg were to announce that under no circumstances would the LibDems enter into a coalition to keep Brown in office, or vote to sustain a minority Labour government, he might well retain many of the 'soft LibDems' who are thinking of voting Tory. But it would be a huge political risk. For in northern seats Labour would campaign on a slogan of Vote LibDem and get a Tory. In the end, this comes down to crude electoral arithmetic. If Chris Rennard believes the LibDems can win more seats in the North than they could lose in the south, Clegg won't take the risk. If, on the other hand, he calculates the reverse is true, it's just possible that Clegg will take the biggest risk of his career so far. If he did, I wonder how his MPs and party members would react. I've just been listening to a speech by James Purnell to the Business Services Association, which was rather appropriately delivered in the bunker of the Cabinet War Rooms. It was full of the usual stuff about rebalancing the relationship between the state and markets. But at the end of the speech he made clear that his department welcomes any approach by the private sector who have ideas about how they could run better the services currently run by government. This was no doubt music to the ears of BSA members like Capita. He said his department already has thirty such proposals on the table which they are considering. All good stuff. But if Conservative DWP spokeswoman Theresa May had said this, wouldn't it have provoked accusations from Labour that the Tories want to privatise the DWP? Earlier this morning I did an interview with the BBC News Channel about the government report which says that the incidence of diabetes is soaring, Between 1997 and 2003 there was a 74% increase in diabetes being diagnosed. The government puts this all down to a dramatic rise in obesity. Up to a point, Lord Copper. I know from my own case that had I not stuffed my face with Mars Bars over the years it is more likely that I would have avoided getting diabetes, or at least put it off. However, it's not always that simple. As I understand it the propensity of doctors to diagnose it has changed over the years. Ten years ago, if you had a blood sugar count of 7, you wouldn't have been diagnosed. Nowadays you would. So it clearly follows that the numbers being diagnosed will rise. In addition, for every patient a GP diagnoses with diabetes, his or her practice gets an annual payment from the NHS - so there is almost an incentive to diagnose borderline cases. This is reflected in the fact that Type 1 cases have been relatively constant. It is the less serious Type 2 (which is what I have) where the incidence has shot up. Research shows that losing weight can reduce the risk of developing type 2 diabetes by 58%. It is imperative that we raise awareness of the importance of eating a healthy, balanced diet and doing at least 30 minutes of physical activity a day if we want to make any headway in defusing the diabetes time bomb. He's right. When I was diagnosed, I did change my diet, I lost more than a stone quite quickly. I am a shame to say that some of it has gone back on, so I now have to redouble my efforts to lose it again. The pills have controlled the diabetes, but you can only ever really start beating it by losing weight and exercising. Do you feel more lethargic than usual? Do you constantly feel thirsty? Are you going to the loo more often than usual, especially during the night? Do you have a numbness on your legs or feet? If you answer yes to three of those, go and see your GP. And in other news, bears have been found defecating in the woods. But seriously folks, there's a report published today by the Hansard Society and Microsoft, which shows that MPs are getting better and transmitting messages on the internet, but they're not so hot at receiving them. Online engagement is still pretty minimal. OK, I suppose we all knew it, but there's some interesting data to be mined in the report. Of the 11% who blog, many don't accept comments [yes, I can see you hiding at the back, Nadine!]. It would have been interesting to have had some sort of international comparisons in the report. I suspect that our MPs are quite a bit ahead of some of their European counterparts, believe it or not. Perhaps someone out there can prove me wrong. 1. Guido reports that Alex Hilton is making a good recovery (from Meningitis) and is on morphine. 2. Dizzy doesn't think much of a new government website called RealHelpNow. 3. Malc in the Burgh on the meaning of time. 4. Martin Bright says if you see Gordon Brown, don't mention to L word. 5. Mr Eugenides on the shamelessness of David Blunkett. 6. Tom Harris on why term limits for MPs are a bad idea. And they are. 7. Charles Crawford looks ahead 30 years. 8. Paul Waugh reckons Ed Balls got one over on Ken Clarke. 9. Labour Peer Toby Harris criticises his own party in Waltham Forest. 10. PoliticalBetting on the latest opinion poll, showing the LibDems crashing by 4 points, and the Tories and Labour both up 2. 11. West Brom Blog says the Government shouldn't bail out a Russian billionaire. 12. Colin Byrne says Mandy & the Chipmunk are talking sense. I just want to say how wonderful the BBC is, and I would happily pay double the licence fee just to be able to access THIS online cornucopia of delights. The BBC seems to have gone Thatcher-tastic this week. On Thursday it is showing the long awaited play about Margaret Thatcher's final days in office, starring Lyndsay Duncan. And to coincide with the 30th anniversary of her election in 1979, the BBC have put together a wonderful archive of video and audio clips detailing Margaret Thatcher's most memorable moments on the BBC. They include her first appearance on Any Questions, a Panorama profile in 1970, the clip from Val Meets the VIPs (which I remember watching as a 10 year old!) and much more besides. I hope they replicate this exercise in many other areas, and for other politicians. It really does fit right into the BBC's public service remit - and I'd be saying that if they did it for Clement Attlee or even Tony Blair. There must be thousands of treasures in the BBC archives which could be utilised in this way. It was not a very hard decision. I had been writing a reform of the welfare system for two years and wanted to see it through. My one-year contract with Labour was up in February and I had done the job I had been asked to do. But it is a difficult project to do in three years. In my time as an advisor I had three secretaries of state and five ministers of welfare. How can you run something which is so difficult and complicated with that kind of change? Let that be a warning to David Cameron. The worst thing that can happen to a government department is to have a succession of different ministers within a short space of time. It means the department lacks direction and leadership. Obviously changes are sometimes inevitable, but David Cameron needs to learn from Freud's experience and resist the temptation to play musical chairs with his Ministers every year. Nadine Dorries MP has just written a blogpost announcing that she was about to start twittering ... but after reading THIS article by Peter Whittle she had second thoughts ... but is now having third thoughts and will probably do it anyway. Anyway, should you wish to prove your insecurity and join Twitter and follow my feed, click HERE! You know you want to. Guido has written an article for Public Servant Magazine giving some pertinent insights into how John Prescott and our "friend" who must not be mentioned are doing in the blogosphere. It's a good read. I gather our dear Prime Minister has informed us that we are living in an "Era of action and interaction". How profound of him. This of course contrasts with Peter Mandelson's speech last week when he said politicians should beware of action for action's sake. He's right. Brown suffers from 'initiative-itis', which has resulted in government ministers running round like headless chickens trying to look like they have a strategy - when in fact all they have are a series of announcements which amount to very little. That's not action, it's called fiddling while Rome burns. Are the LibDems a Political Party or a Pressure Group? The scorched earthers are already venting their spleen in the comments, but surely this is sensible politics? I remain of the view that a Hung Parliament is still a very likely result of the next election. Of course I would like to see the LibDems obliterated, but although they are likely to lose a few seats, I don't expect them to self combust. It is sensible at this stage to see what levels of cooperation are both desirable and achieveable. If nothing else, it will force the LibDems to decide whether they are a political party or a pressure group. Pressure groups have the luxury of spouting forth on every issue of the day with no ability to ever gain power and change things. Political parties exist because they are hungry for power and want to effect change. The LibDems have just over a year to decide which they are. Is the future of TV digital? 1. Peter Cuthbertson asks why political interview are conducted the way they are. 2. Phil Taylor on the future of the Government Car Service. 3. Ben Brogan limbers up for Telegraph Towers with an attack on Gordon Brown's 'sovietisation' of the City. 4. Welsh Ramblings on why Labour faces disaster in the Welsh Euro Elections. 5. Fraser Nelson on why Cameron needs to level with the public. 6. Archbishop Cranmer wins a small, but important, battle with Facebook. 7. Greg Hands on the German Finance Minister who is speculating about the collapse of the Euro. 8. Events, Dear Boy asks why the BBC bows to Labour's agenda. 9. Matt Wardman exposes Derek Draper's Twitter-trolling. 10. Douglas Carswell apologies to Tom Harris. 11. Guido on the MEP Millionaires. 12. Chris Ames explains when being private isn't being private at all. Should you have nothing better to do on 12 March, I will be hosting AN EVENING WITH CHRIS MULLIN at the Stratford Theatre (in association with the Newham Bookshop). I'll be interviewing Chris about his soon to be published diaries (serialised today in the Mail on Sunday) and then he'll be taking questions from audience. Tickets are only £5 and can be booked HERE. You can pre-order A View from the Foothills HERE. Ed Vaizey has made an interesting suggestion today. He says that the days of the Ministerial Mondeo should be numbered, and that only those Ministers who security demands it, should have cars. He reckons upwards of £10 million could be saved. I suspects that's not the half of it. Moving from the specific to the general, I reckon there are literally hundreds of cost saving measures in government of this small magnitude. But added together they add up to a lot. And it's the small, seemingly insignificant savings, which often have more effect on public opinion than the big headline savings. People understand what saving £100,000 means, but when the talk moves to billions, their eyes glaze over. Ministers work ridiculously long hours, have to carry out all their ministerial duties on top of all their constituency duties and try, somehow, to fit in a family life as well. A car and driver makes life easier and, as Iain accepts, doesn’t cost the public purse that much in the grand scheme of things. Yes, a ministerial car is a perk. So let’s hear it for perks! Because if you’ve just had a 12- or a 14- hour day and you’re leaving the Commons after the last vote, it’s wonderful to be able to slide into the seat of a car and relax while you’re taken home, knowing you’ll be lucky to get six hours sleep before your ministerial diary kicks in the next morning. Yes, that really convinces me Ed and I have got this wrong... Not. I took part in a seven minute discussion on the South East edition of the Politics Show this lunchtime. The other participants were the Labour leader of Swanley Town Council, Ian Rashbrook and the LibDem PPC for the area Alan Bullion. Even though I probably spoke for slightly longer than the others, I continue to wonder what value these type of discussions have. It's a complicated subject but the temptation, when you know you have probably 90 seconds or two minutes to make your point, is to resort to a soundbite or to prepare your answer and give it no matter what question you are asked. The final question Paul Sieghart asked was about the BNP's prospects in the Euro elections on June 4th. I think it is a very real possibility that they will win a seat. Because of the electoral system, if they manage to become the party which receives the largest share of so-called 'dustbin' votes, it's entirely possible they will get their first MEP, although I am not sure which region is most likely to suffer the ignominy. I gather 8-13% of the vote will guarantee a representative. A lot will depend on what happens to the Green vote and the UKIP vote. It may be that quite a few LibDems and Labour voters 'lend' their votes to the Greens in order to keep the BNP out. To be honest I haven't a clue how tactical voting works under the PR system for Euro elections. No doubt someone can enlighten me in the comments. 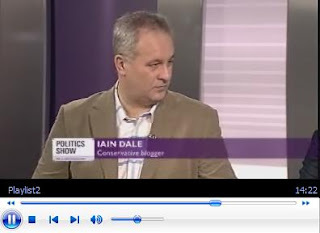 To watch the Politics Show interview, click HERE and scroll in 12 minutes. Well, if you've been following my Twitter feed you'll know that it's been quite an evening at Dale Towers near Saffron Walden. We've been spending the weekend with my parents at their farm (where I grew up) in Ashdon. At about 9pm my partner John went out for a smoke and came rushing in saying he thought there was a fire at the back of the farm, where my father lets one of the villagers work on his stock cars. We rushed round there - it's about 300 yards from the house - and the flames were leaping 30 feet in the air and were threatening a barn and a mobile phone mast. I phoned 999 and within about ten minutes three fire engines carrying about 20 firemen arrived from nearby Linton and Saffron Walden. They soon had it under control. Around half an hour later two police arrived. I shall be careful what I say, but it is pretty clear it was arson. People were seen running away from the farm. Villages are small places. People know things. The stock car guy knows who did it. I know who did it. The police know who did it. Will they be charged? Will they buggery. Still, the evening did have some consolation for my two sisters. They spent the entire time trying to snog the firemen and making jokes about helmets and sliding down poles. I, of course, maintained my decorum at all times. 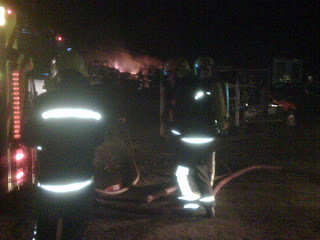 Finally, a word of praise for Essex & Cambridgeshire Fire Brigade. They were superb this evening. Thanks, guys. The hardest and most important parts of the speech to write were the jokes. Margaret Thatcher is not naturally a joke-teller although she has a dry sense of humour, However, she recognises that without jokes, a speech is flat and dull. A good joke-writer was therefore valued above all others. On our core team, we had two principle joke-writers: the late Sir Ronnie Millar and John O’Sullivan, a journalist and commentator who had been brought in to the Number Ten Policy Unit. They had very different styles and each brought a different kind of humour. However, in each case, Margaret Thatcher frequently required persuasion that what they had written was indeed funny. In 1990, the Party Conference speech was particularly important. 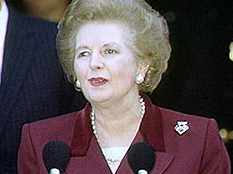 Margaret Thatcher was under heavy attack and had recently suffered the resignation of her Chancellor, Nigel Lawson. Her speech had to be as good as she had ever delivered. A few weeks earlier, the Liberal Democrats had unveiled their new Party symbol. It was supposed to represent a bird taking wing, but in the mind of John O’Sullivan it immediately became a dead parrot. He decided that he would write a section of the Speech devoted to mocking the Liberal Democrats and would include a section of Monty Python’s Dead Parrot sketch. To anyone familiar with Monty Python it was a terrific idea and very funny. Unfortunately, the Prime Minister had not even heard of Monty Python. When we came to read through the draft of the speech, Mrs Thatcher paused when she reached the dead parrot section and looked at John O’Sullivan as if he were completely mad. We knew that this would happen and so had prepared our strategy in advance. ‘This is’, I explained, ‘one of the most famous comedy sketches ever written. It will be instantly recognisable to every person in the audience.’ I was slightly less certain of this latter point, knowing Conservative audiences, but all of us present insisted to the Prime Minister that it would be the highlight of her speech. The joke survived that read-through but I knew that she was not convinced. On each subsequent occasion, whenever we reached the parrot section, she stopped and said: ‘Are you sure that this is funny?’ After about the third or fourth occasion, she tried a new tack. ‘I need to see the sketch,’ she said. ‘If I am to deliver it then I need to get the inflexion absolutely right.’ As it happened, I had at home a video of the Python film And Now for Something Completely Different, which contains the dead parrot sketch. I therefore brought it into the office the next day. In the days leading up to the Conference, the Prime Minister required constant reassurance that people would find the lines funny. She was clearly still full of doubt. However, I was able to get to enough people in advance whose opinion she was likely to ask that she was eventually persuaded. Every time we ran through the speech, I found myself laughing at the passage which simply added to the Prime Minister’s puzzlement. To try to explain to her that Monty Python did not really exist would have been to risk disaster. I therefore did not even try and instead said to her: ‘Absolutely, Prime Minister. He is a very good supporter.’ Thus reassured, she went on to the platform to give the speech. She did so perfectly and received the biggest laugh of all when she delivered with perfect comic timing the words of the dead parrot sketch. Hope you enjoyed the clip!